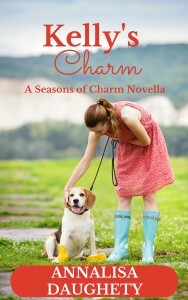 Kelly’s Charm is the first novella in my Seasons of Charm collection. It’s been so fun to re-visit the characters from Love Finds You in Charm, Ohio. If you read or watched Love Finds You in Charm, you already are familiar with Kelly Bennett, so today I want to introduce you to Jason Thompson. You can get to know Jason better by reading Kelly’s Charm. Up next in the collection will be Summer Full of Charm, which releases later this month! Here’s a snippet of Kelly’s Charm! Enjoy! Kelly Bennett kicked the flat tire on her red sports car. What a day for a flat. The deserted road between Sugarcreek and Charm may as well have been in Timbuktu. For what seemed like the millionth time this week, Kelly wondered what she was still doing in tiny Charm, Ohio. She’d moved here two years earlier, fleeing a bad relationship and searching for a place to call home. Her Aunt Irene’s inn, right in the heart of Charm, had offered both a job and a home. And the friendship she’d formed with Amish-born Emma Miller, now Weaver, had cemented her place in Charm. But lately, Kelly had been wondering if she was truly living in Charm or just continuing to hide there. The sleepy Amish town was full of friendly faces and delicious food, but Kelly couldn’t help but wonder if becoming a permanent resident of Charm had been a mistake. And today, faced with a flat tire, no help in sight, and a cell phone with no signal. . .she wished she was anywhere but Charm. A black SUV approached and Kelly breathed a sigh of relief. The driver pulled the vehicle behind Kelly’s car. A guy about her age got out of the drivers’ side. “Need some help?” he asked. She took a step back. He was classically handsome in a tall and dark kind of way. His brown hair served as a great contrast to piercing blue eyes. “Need some help?” he repeated, slower this time. “Sounds like a problem to me.” He grinned and revealed teeth that were likely the pride of his dentist back home. Kelly brushed a speck of dirt from her skinny jeans. She was glad she’d taken a little extra time getting ready today. Her favorite red sweater, dark jeans and tall black boots always made her feel good. She’d chosen the outfit specifically today because it would be one of the last times she could wear the sweater until the fall. She loved spring and summer, but for some reason fall and winter clothes were more her style. Kelly was taken aback. Dinner? She hadn’t expected that. “I don’t know about that.” She was shocked by how tempted she was by his offer. She couldn’t believe she was even considering it. He was a virtual stranger. Wasn’t that what all serial killers said? Not to mention a couple of ex-boyfriends Kelly was still trying to forget. “Thanks for the offer. And for the Fix-A-Flat.” She smiled. “But I don’t think I should.” She opened her car door and got inside. “Suit yourself.” Jason closed the door for her. She started the car and rolled the window down. “Thanks. Do you know the way to get where you’re going?” she asked. The least she could do was offer some directions. “I sure do.” He thanked her and told her goodbye. Kelly sat still for a moment. She should’ve said yes. She could just add that ‘no’ to her list of regrets. A list that seemed to be growing out of control. Annalisa Daughety writes contemporary fiction set in historic locations, including the Walk in the Park series, Love Finds You in Charm, Ohio, and A Wedding to Remember in Charleston, South Carolina. She lives in Arkansas and is hard at work on her next book. Annalisa, this book looks great! An inn, Amish country, and my home state of Ohio….can’t wait to read it. Thanks for sharing. Sounds like an interesting story. A pet on the cover is always appealing. It’s amazing how a character can be revealed with simple questions. “Favorite movie? Anything with John Wayne.” That reveals so much about Jason. Thanks! Yes–I think so too! I read the first chapter from Kelly’s Charm and it drew me in. I just bought it and had it downloaded to my Kindle. Looking forward to reading it. Thanks! :) Hope you enjoy! Oh, from this blurb, I’m putting this one on my to-purchase list! Unfortunately we don’t get the channel that has the show “Love Finds You In Charm” so I feel like I’m missing out on something good! Thanks for sharing about your book, Annalisa!